Get directed edge The directed edges of vT are returned vDirectedEdgesOut. Directed means that each edge (a,b) with two adjacent triangles in vT is returned twice, as edge(a,b) and edge(b,a). A number of methods in Fade returns an unorganized set of edges that delimit a certain area. But sometimes it is more beneficial to have these edges organized as a set of one or more polygons. This is the purpose of the present method. [out] vvPolygonsOut contains one vector<Edge2> for each polygon found in the input data. The present function adds one vector<Edge2> to vvPolygonsOut for each polygon found in vEdgesIn. Each such polygon starts with the leftmost vertex (and when two or more vertices share the smallest x-coordiante then the one of them with the smallest y-coordinate is chosen). Edges that do not form a closed polygon are returned in vRemainingOut. An Edge2 object represents an edge of a triangle. Triangle corners are always counterclockwise (CCW) oriented. Thus outer polygons are CCW-oriented while hole-polygons are CW-oriented, see the figure. This function was experimental and is now deprecated because 3D point cloud meshing has been moved to the WOF library. [in] vPolygonSegments contains the segments of a closed, simple input polygon along with normal vectors. The segments are counterclockwise oriented and ordered with respect to the surface to be created. Check twice, the orientation is very important. The normal vectors point in the direction of the thought surface at the segment i.e., if a hole is filled, the normal vector of an adjecent triangle is taken but if a T-joint is filled the normal vector should be the average normal of the two triangles at the edge. [out] vCornersOut contains the created fill triangles, 3 corners per triangle, counterclockwise oriented. 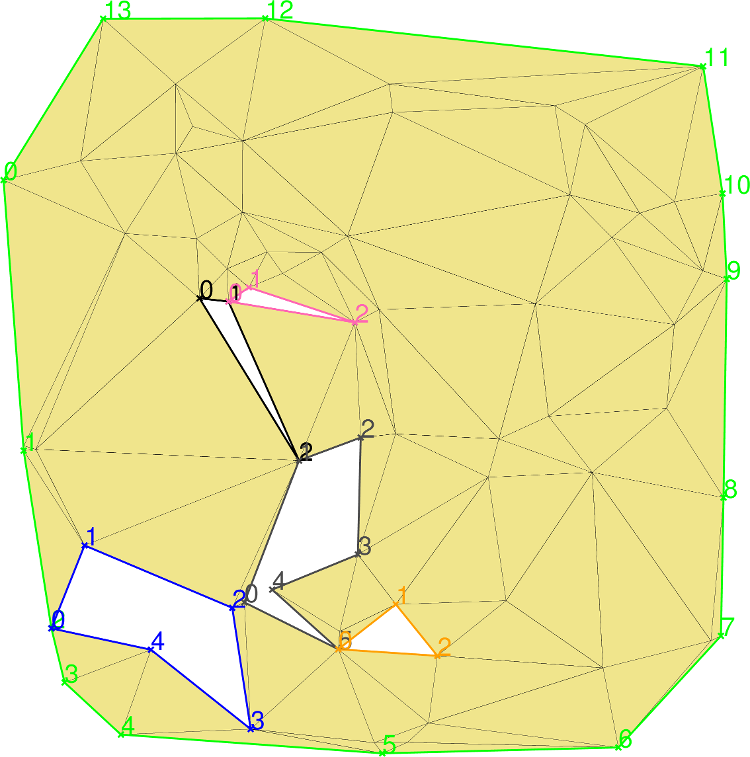 [in] vMeshCorners specifies the input mesh, 3 points per triangle in counterclockwise order. [in] vPolygonSegments are the edges of the closed polygon to be triangulated. [in] vPolygonEdges are edges of the polygon to be triangulated. They must form a closed polygon in the mesh. Computes the border of the triangles in vT. The border consists of all edges having only one adjacent triangle in vT.
Returns the normalized normal vector of the triangle defined by the three input points p0, p1, p2. [in] p0,p1,p2 When these points are counterclockwise (CCW) oriented then the resulting normal vector points towards the viewer. [out] bOK returns true for valid results. When the plane defined by p0, p1, p2 is degenerate, bOK returns false. A unique set of edges of vT is returned. [in] vSegments specifies segments to be checked. Degenerate segments (0-length) are ignored. true when vSegments contains a closed polygon without selfintersections. False otherwise. The segments in vRing are reoriented and sorted such that subsequent segments join at the endpoints. The segments in vRing are reoriented and sorted such that the resulting polygon is counterclockwise oriented and subsequent segments join at the endpoints.